Carp are a noxious pest, a non-native introduced species. They breed like crazy destroying our native fish, causing environmental damage to our river systems and natural fauna. But you know what? Despite all of the negatives, I love targeting and catching carp or AKA mud marlins. Carp are a large freshwater fish native to Europe and Asia. In Australia, we are more commonly used to the European carp. These fish thrive in our waters and eventually take over many of the river systems. Overseas carp fishing is all the rage and quite often considered a trophy species particularly in Europe. Locally carp have a bad reputation and just the word carp seems to put locals anglers into a rage. Before we get bogged down with all the negatives let’s focus on some positives. Surprisingly carp is a very underrated sports fish that put up one hell of a fight. Anglers like myself enjoy targeting carp and have respect in chasing a freshwater fish that can grow over a meter in length outside your doorstep. Here is a guide with some helpful tips for you which will help improve your catch rate when targeting carp. Make sure you continue to berley an isolated area which will bring the carp towards your baits. Berley as simply as chopped bread and corn will work well to keep them hanging around and feeding. Fishing for carp with soft plastics and hard body lures is a whole new ball game. It does take some time to perfect and often becomes a case of sight casting. What I mean by sight casting is waiting for a carp to swim by or surface then flicking a soft plastic or hard body lure towards it and slowly working the lure past it, hoping it will take the plastic or lure. I have had success with this method using small grub style soft plastics such as Squidgy wrigglers, Z-Man grubs, strike tiger nymph plastics and shrimp imitations such as the Savage gear manic shrimp. I have also had some success on hard body lures such as Savage Gear Fathead and Atomic cranks. A general-purpose fishing rod around 7 foot in length in a 3-5 kilo or 4-6 kilo class is perfect for this style of fishing. This is light enough to allow you to enjoy the fight and heavy enough, so you can stay in control and land the beast. You would generally couple this with a 3000 or 4000 size reel and 8 pounds or 12 pound line. I’m always looking for new ways to challenge myself. I have been known to chase big carp on rod outfits as light as 2-4 kilos with a 2500 reel on 6 pound line which adds a whole new dynamic to trying to land a monster. It requires a certain amount of control and patience which really teaches you the art of landing a big fish, especially at the end when trying to land them as they tend to go on late runs and this is often where you loose them. We recommend using 3 simply fishing rig setups for targeting carp. Place a small running sinker to the main line ( main line shown in blue ) which is usually around 8 pounds. Then tie a medium swivel to the end allowing the sinker to run up the main line freely. Then tie on the other end of the swivel 50cm of 8 pound fluorocarbon leader ( leader shown in grey ). Finished with a hook. I generally use a size 6 bait keeper hook or size 10 long shank which is perfect for corn kernels or scrub worms, however, you can also use small treble style hooks which is a better setup if you using bread. This is simply the easiest rig you can imagine simply tie a size 6 bait keeper hook or size 10 long shank hook or a small treble hook to the end of your line and fish unweighted. This is a great option if your fishing off a jetty or pontoon or if you know the carp will come in quite close to the edges. Attach a quill or bubble float to your main line. Thread the line through and adjust the length using a size 6 bait keeper hook or size 10 long shank keep your bait suspended at a good depth. Ideally cast down breeze which will stop the float from coming back to you. If you’re not getting bites then adjust the line depth and If necessary add a splint shot to add weight. Carp are not big strikers, often they will play with your bait or sit on top of it for a little while so play close attention. Some of the biggest carp I have caught hardly moved the line. Carp will often follow bird life, I think this has more to do with locals feeding the birds and creating a frequent berley trail in a concentrated area. Keep a close eye on the water as carp will frequently surface and in some lakes come crashing out of the water. In warmer months you will often see them along the banks where the water is cooler. Keep your drag set loose. I have learned this the hard way. This year alone I have lost 3 brand new rod setups by forgetting to loosen the drag after catching a decent sized one. A simple blink and the rod is gone. In my case, this means I have lost some good and expensive kit. Carp aren’t too be too fussy and you’ll be able to catch carp all day long. I do however find that the first 2 hours of light and last 2 hours of light generally produce a few more bites. Sometimes you can target carp during the day when other target species have shut down. Carp can be caught all year round however, I believe as it starts warming up towards October is when the carp fishing comes alive. I love fishing and I’m happy catching any type of fish regardless of the size or species. Yes, carp are a noxious pest and ones that do need to be destroyed but they are also so much fun to target and catch. There also a brilliant species when fishing with kids as your sure to land plenty of them. 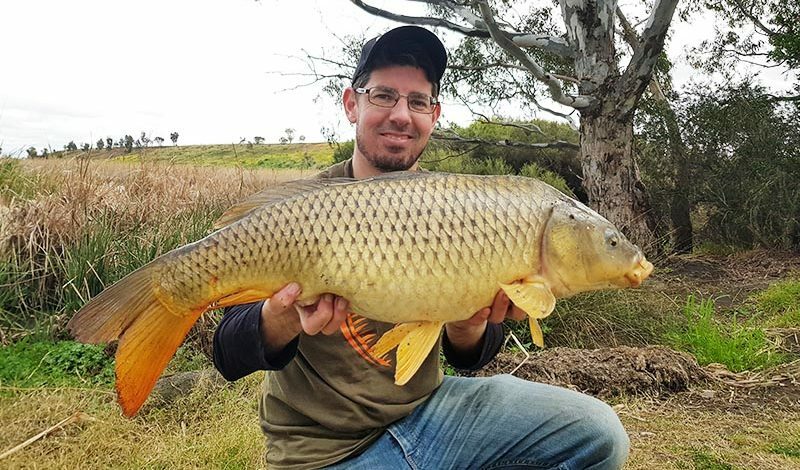 If you have any ideas on carp fishing then please share them by emailing reports@fishingmad.com.au or if you would like to send us pics of you carp fishing we would love to add them to the page.